On July 17th, I ran in the Washington Warrior Dash. My decision to do so was somewhat accidental. While walking with a few girls from GeekGirlCon at a charity walk for IGNITE, the topic came up and one of them (Adrienne) was looking for someone to dash with. I casually offered. After the dash, I learned that she and I had both been ok with the idea that the other might not e-mail, follow up, or just generally drop the idea. We are both motivated women, though, and could never be the one to back out – which was a good thing. Aside from my weight loss over the past year, I didn’t do much to train. I was on vacation for nearly 3 weeks prior to the run and was only able to fit in the occasional jog or walk on the beach. I would feel very self-conscious from time to time, that I might be the only non-fitness nut who was there. I took comfort looking at pictures from other dashes (and finding some others who looked like they might be more in my league) and remembering that the articles and FAQs that stated that most people – even your average couch potato – should be able to finish all of the obstacles and the race. It’s more about mental toughness than physical fitness was the promoted mantra. My goal was to finish and complete every obstacle – not finishing last would be gravy. I am thrilled to say that I reached my goal and I was definitely not last. 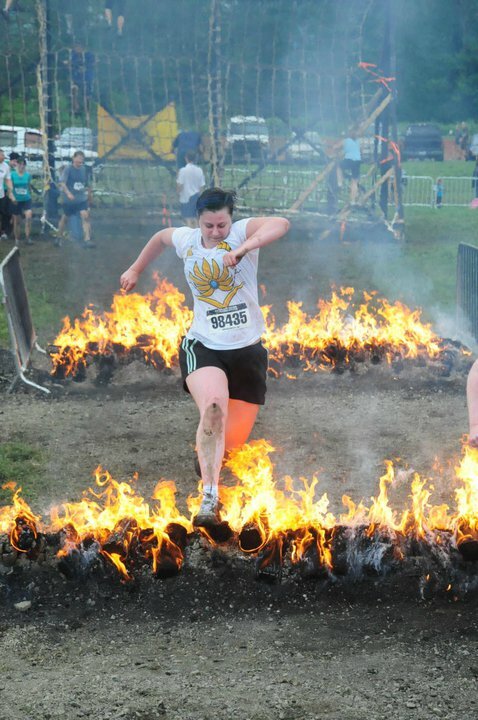 The dash is about 3.5 miles with 11 obstacles. You can review the obstacles at the Dash Site. I finished in 1 hour, 15 minutes and 54 seconds, and I did complete every obstacle. The hardest obstacles were the vertical wall, the balance beam-ish obstacle, and the mud at the end. I expected the wall to be difficult. When you’re on top, it’s much taller than than it looks, and moving from scaling to climbing down is the first time you really look down and see how high up you are. No harnesses or safety nets. Of course, at that point, you’re getting down one way or the other. I told myself, “Well, if I fall, I’ll just fall on the correct side – trying to get down.” And then I climbed down with no problem. After I was on the ground, I did experience a couple moment of dry heaving – I was very happy that I hadn’t eaten before the race that morning – but that quickly cleared up and I pressed on. The other two harder obstacles surprised me. I didn’t expect them to be a problem. The balance beams were mostly scary because they were wet and muddy by the time I reached them. Slipping seemed inevitable. However, I did complete it – thanks in no small part to Adrienne’s cheering. The mud was difficult for two reasons: it was the end of the race, so you were already exhausted, and it was THICK. My God, was it thick. So, not only did you have the resistance to push through, you had the mud holding onto your limbs and sucking you back. And the bottom of the mud was rocky, so my knees got scraped up a bit. But I did it! Rawr! Will I do it again? considering my husband and I are looking into beginning strength training in the near future, I think so. I would love to complete it again and improve – have it be easier and not be REALLY sore for 2 straight days afterwards. We’ll have to see how the dates line up though, as July is busy with our anniversary, OCON and related travel.